The Exotic is nicknamed “the lazy man’s Persian” because he shares the Persian’s sweet face, but his short, plush coat is easier to care for. 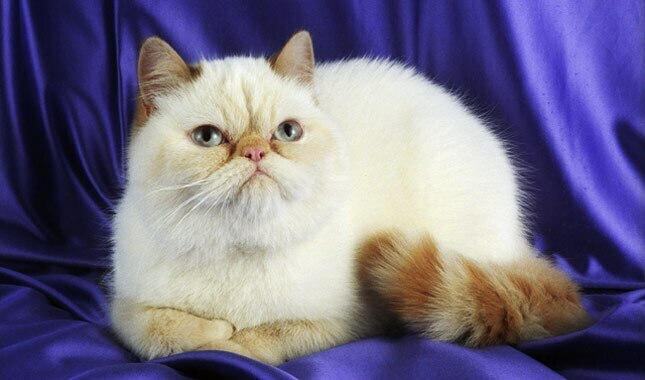 Exotics are more lively than the laidback Persian, but they also love to sit in a lap. They can live to be 15 years or more. Sometimes Exotic kittens are born with long hair. Depending on the association, they can be registered and shown as Exotic Longhairs or Persians. 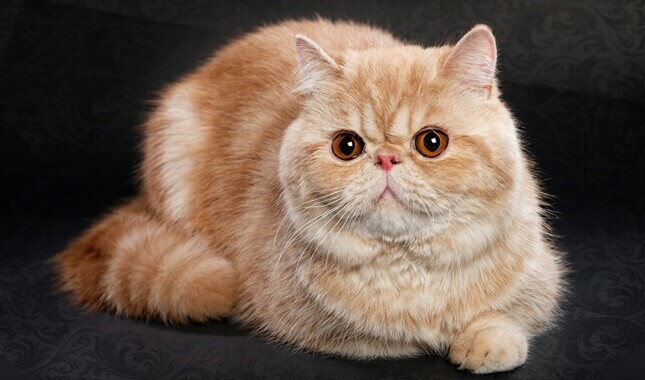 If you love the look of the Persian but can’t face the thought of daily grooming, consider the Exotic Shorthair. Developed through crosses between Persians and American Shorthairs, plus Burmese and Russian Blues, he has the look of the Persian but with a short, plush, easy-care coat. 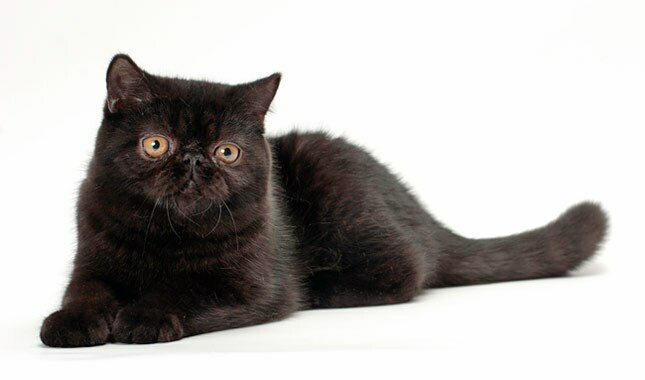 Here’s what you need to know if you’re considering acquiring an Exotic Shorthair. The lazy man’s Persian, as he is sometimes nicknamed, is as squeezably soft as a package of Charmin. He has the sweet, gentle face of the Persian, as well as the same body type, but is somewhat livelier, a nod to his American Shorthair heritage. He will play endlessly with a fishing pole toy and plot how to get access to it when you have put it away. For the most part, though, he loves to be a lap cat and has an easygoing and undemanding personality. The Exotic communicates with his expressive eyes and his soft, melodious voice. He is adaptable and will enjoy living with any family as long as they love him. The Exotic was originally intended to be a silver cat and was going to be called the Sterling, but today he is found in all the same colors and patterns as the Persian: solid, silver and golden, shaded and smoke, tabby, particolor, bicolor and Himalayan. His short coat is easily cared for with a weekly brushing. The Exotic is a loving lap cat with a somewhat more lively personality than the Persian. The Exotic has the look of a Persian but with a short, plush coat that comes in many beautiful colors and patterns, including tabby, tortoiseshell, black and white, and chinchilla silver. The word round is key when speaking of this breed. Exotics have round eyes, round heads and rounded bodies. Exotics can live to be 15 years or older. 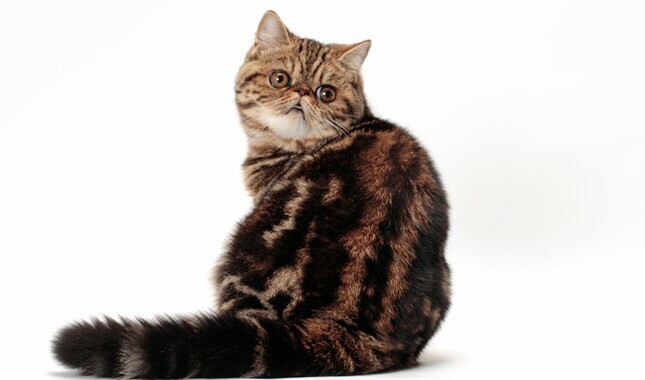 Is the Exotic Shorthair Right for You? The Exotic is something of an accidental breed. The original intent of the American Shorthair breeders who got the ball rolling was to breed their cats to Persians in an effort to bring in the silver color and green eyes of that breed. The resulting kittens didn’t look like American Shorthairs, but they were very attractive, having the Persian look but with a short, plush coat. Other breeders brought in Burmese or Russian Blues to get the gene for the short coat. 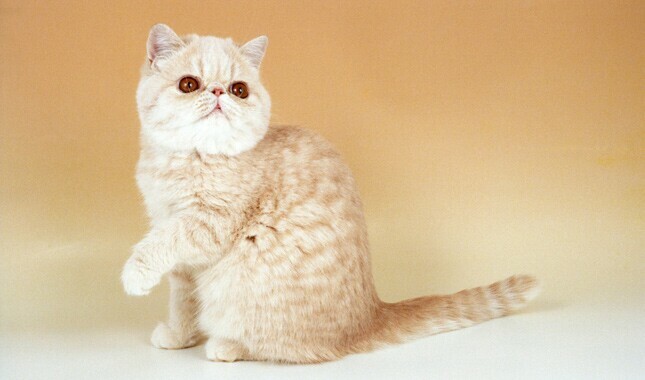 The various offspring were bred back to Persians, and a new breed was born: the Exotic Shorthair, or just Exotic. 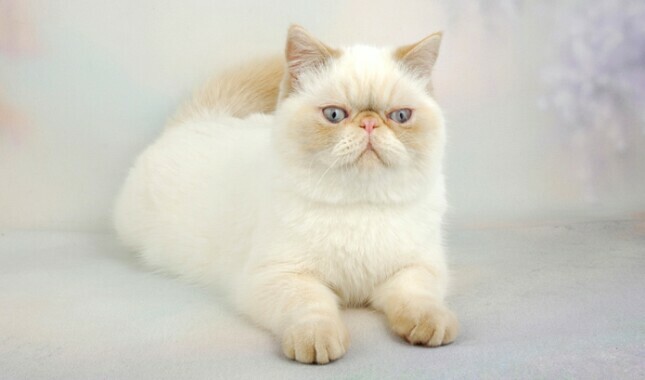 Today the breed standards for the Persian and the Exotic are identical, except for coat length. Both have a sweet expression, short nose, big eyes, and a short, square body, all coming together to make a cuddly doll of a cat. The Exotic is one of the most popular cat breeds, second only to the Persian, according to the Cat Fanciers Association. The endearing Exotic is a peaceful, easygoing companion who will be content to quietly follow you around and then sit in your lap for petting whenever you give him the chance. Males have a reputation for being especially sweet and loving. Females can be a bit more independent, but they are just as devoted and loyal as males. Exotics love their own people, but around strangers they are cautious at first. Given time, they usually warm up to visitors. Exotics have hereditary health issues that can be a concern, especially if you aren’t cautious about who you buy from. They include polycystic kidney disease (PKD) and a tendency to develop calcium oxylate stones in the urinary tract. Responsible breeders take steps to avoid these problems. Exotics should be healthy and vigorous, able to breathe normally and produce only normal amounts of tears. Polycystic kidney disease is a hereditary condition causing enlarged kidneys and kidney dysfunction. Cysts can often be found via ultrasound by 12 months of age, although kidney failure may not occur until later. Reputable breeders are working to establish PKD-free breeding programs. Fortunately, DNA testing is available, so it is easy to identify and eliminate. Ask the breeder for proof that both of a kitten’s parents are free of kidney cysts, which can be detected on ultrasound or with a DNA test. If one of the parents is PKD positive, which may be the case if the cat’s bloodlines are otherwise valuable, confirm that the kitten you are purchasing has tested PKD negative. Exotics may have breathing problems, due to their flat faces, and are sensitive to heat. They need to live in air-conditioned comfort, protected from hot weather. Keep in mind that many airlines will not transport them in the cargo bay (which isn’t recommended for other reasons, as well) because of their potential for respiratory distress or even death in stressful conditions. Remember that after you’ve taken a new kitten into your home, you have the power to protect him from one of the most common health problems: obesity. Keeping an Exotic at an appropriate weight is one of the easiest ways to protect his overall health. Make the most of your preventive abilities to help ensure a healthier cat for life. The short coat of the Exotic does not mat or tangle and is easy to groom. Comb him once or twice a week with a stainless steel comb to keep his coat beautiful. The Exotic sheds seasonally and will need additional grooming and bathing during that time to remove dead hair. After a bath, dry him thoroughly with a professional stand dryer or a hand-held blow dryer, but keep the temperature setting on low to prevent burns. Because of his pushed-in face, the Exotic’s eyes can have a tendency to tear. To prevent ugly staining, wash his face daily, particularly beneath the eyes. Trim the nails as needed. You want your Exotic to be happy and healthy so you can enjoy your time with him, so do your homework before you bring him home. 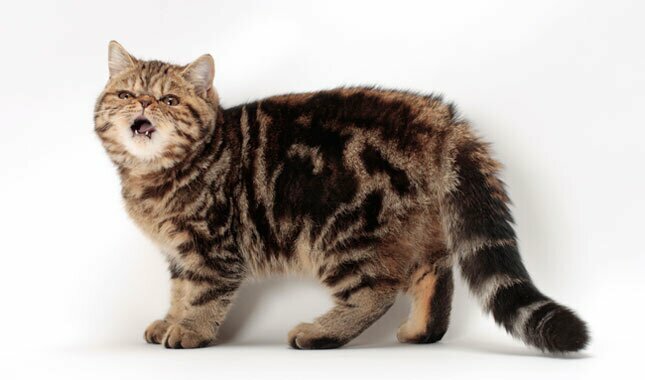 For more information on the history, personality and looks of the Exotic, or to find breeder recommendations, visit the websites of the Cat Fanciers Association, the Fanciers Breeder Referral List, The International Cat Association and American Cat Fanciers Association. Be patient. If you want a particular color or pattern, you may have to wait six months or more for the right kitten to be available. Many breeders won't release kittens to new homes until they are between 12 and 16 weeks of age. Before you buy a kitten, consider whether an adult Exotic might be a better choice for your lifestyle. Kittens are loads of fun, but they’re also a lot of work and can be destructive until they reach a more sedate adulthood. With an adult, you know more about what you’re getting in terms of personality and health. If you are interested in acquiring an adult cat instead of a kitten, ask breeders about purchasing a retired show or breeding cat or if they know of an adult cat who needs a new home. A breeder is not your only option for acquiring an Exotic. Although Exotic kittens are almost never found in shelters and rescue, adult Exotics, both pedigreed and mixed, are not so fortunate. They may end up in shelters or rescue groups through no fault of their own. 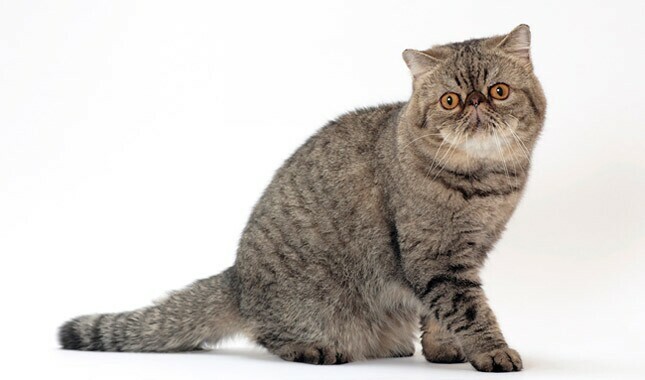 You may find the perfect Exotic for your family through Persian Cat breed rescue groups or by checking your local shelters or the listings on Petfinder. Kitten or adult, take your Exotic to your veterinarian soon after adoption. Your veterinarian will be able to spot problems, and will work with you to set up a preventive regimen that will help you avoid many health issues.